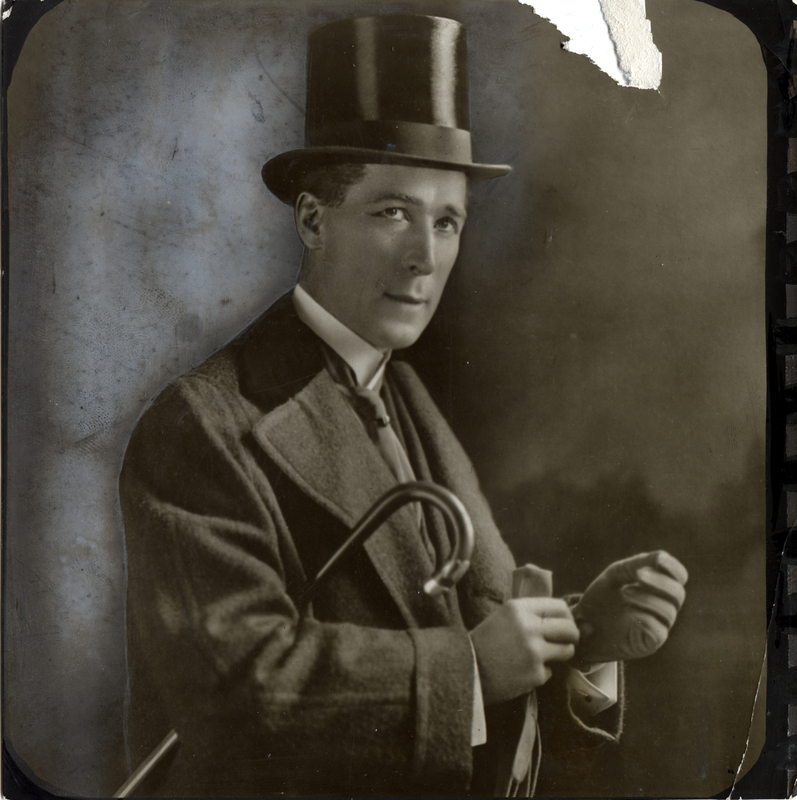 Wire service photograph of actor William S. Hart prior to June 1919. Origin and source of photo unknown. Measures 5¾ inches square. Hart is shown in what appears to be a heavy wool jacket with top hat and cane, and he's putting on his unspoiled gloves  the attire of a gentleman, not that of the cowboy he was famous for playing. Stamped on the back of the photo, probably at the time of creation, is the message: "If you do not think Wm. S. Hart can appear in anything but the clothes of a plainsman, have a look at this picture." Also stamped or typed on the back is the notation, "Filed before June 1919." Whatever newspaper or magazine archive it came from, the handwritten notes on the back suggest this print was used multiple times. Someone updated the information to include the date of Hart's death on June 23, 1946. A notation reads, "For use on Mag Page Tuesday 6/25." June 23 was a Sunday, so we can infer that this print accompanied Hart's death notice in the periodical. Of interest is the technique used to prepare the photograph for print. Rather than paint out the background with a masking fluid for a cut-out effect (a typical method prior to the computer age), our mystery photo editor carefully etched around Hart's coat, face and hat and applied something else, possibly an acid, to soften the background on the left; less so on the right. This print might appear to be mounted, but it isn't; the black space and what look like sprokets at right are part of the image. LW2284a: 9600 dpi jpeg from original photograph purchased 2012 by Leon Worden.